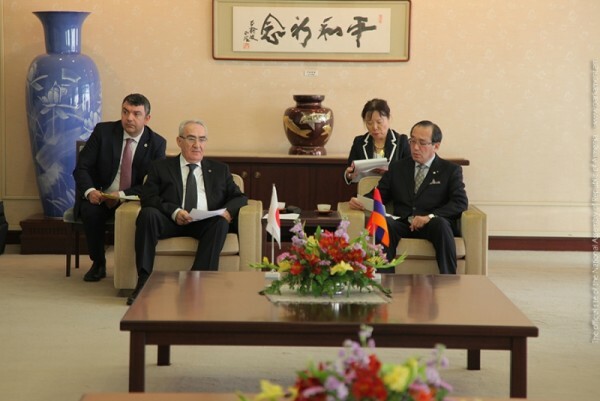 The delegation led by the RA NA Speaker also visited Hiroshima Peace Memorial Museum, where its members got acquainted with the documents witnessing the atomic bombing. Honouring the memory of the victims, the delegation led by the RA NA Speaker Galust Sahakyan laid a wreath at the Victims’ Memorial. Galust Sahakyan left notes in the Memory Book of the High Ranking Guests of Hiroshima Municipality and Hiroshima Peace Museum. After visiting Hiroshima the RA Parliamentary Delegation paid a visit to the City of Kioto of Japan, where they went to Kiyomizu-dera and Kinkaku Temples and Hein Jungi Shirne.